Love, Actually: Life is SWEETER with this in it! Life is SWEETER with this in it! I wish I had a creative name for this DELICIOUS warm caramel sauce, but I don't...so, I call it, "Warm Caramel Sauce" (other suggestions welcome!). 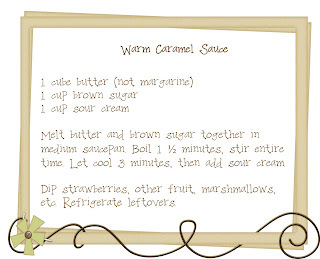 This has become a classic recipe at our house and I use it a lot for romantic evenings, mainly because it is my husband's absolute favorite...and honestly, it is THE best caramel sauce ever. It's one of those tastes that makes you say "mmmm..." after every bite. It goes best with fresh strawberries (...but marshmallows, angel food cake, etc. go well with it, too). Seriously...what are you still reading for? RUN to the kitchen and MAKE this! PS--I have linked this to Tuesdays at the Table because this recipe NEEDS to be passed around. So, welcome to those of you over from "My Chihuahua Bites". Take a look around! I am so glad you posted this recipe. I absolutely loved it! That sounds divine! :) I'll have to try that this weekend, thanks for posting! This will sound like a crazy stupid question, but when you say a "cube of butter", is that a Tbsp or a stick? Stupid, right?! Do tell, I wanna try! Super cute blog, by the way! Just to clear this for everyone. When i say "cube of butter" I mean a stick. Make sure it's REAL BUTTER though....not margarine! Oh my!! Can't wait to make this! I love caramel, and this sounds amazing. Thanks for sharing. This looks amazing! Thanks for stopping by Tuesday Tastes! I think you may have forgotten your Party favor Button... head on over and grab one when you have a minute! This sounds so amazing - Can't wait to try it!